Within nature, trees play a vital role. They provide us with fresh air, oxygen, water, and food. 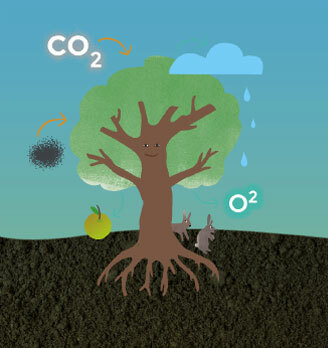 They remove dust particles, prevent erosion, use CO2 for their growth, and cool the planet. Unfortunately too many trees have disappeared from earth. As people we rarely think about the fact we can’t live without nature, and especially without trees. It is clear to more and more scientists that the disappearance of trees is an important contributor to climate change and the warming of our planet. By planting more trees, and by making sure deforestation changes in reforestation, we can secure a future for our children in which they can breathe, drink, eat and live. Do you want all the information on what trees do and why they are essential? Read the free e-book here. 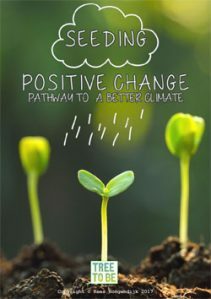 In the e-book “Seeding Positive Change” you will find the entire account of trees, climate and the viability of our earth, including scientific background and facts.